A woman has said she was left "in bits" after finding a secret message hidden on her wedding shoes from her terminally ill mum who had died. Bride Emma, from Kibworth Beauchamp in Leicestershire, got engaged in 2016. But one month later, her mother was diagnosed with terminal cancer. She had hoped her mum could have attended the wedding, but she died in 2017. When Emma received her bridal shoes last week, she discovered her mum had secretly paid for them. And written on the soles of the shoes was a surprise message, which read: "Wanted you to have a gift from me on your wedding day. 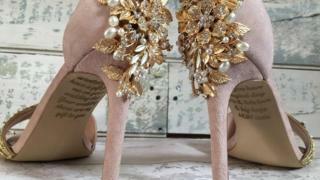 Your wedding shoes are my gift to you. "Hope you have a magical day. Lots and lots of love and big hugs, MUM xxxx"
Emma, 38, who is due to get married to fianc?? Richard in August, said: "It's been so hard planning a wedding without having her with me, and I have had lots of tears." She said she received the shoes in the post on Saturday, adding: "I had absolutely no idea, my fianc?? knew about it. It was just an absolute shock. "I pulled out the one shoe and I saw part of the message and I couldn't think who it would be." She said that when she realised it was from her mum, "I started to cry... I was just absolutely in bits. I couldn't breathe, I couldn't talk." She added that her mum, who had been given between one and two years to live after being diagnosed with lung cancer, had been writing letters to members of the family. "I didn't get a letter, she just ran out of time," said Emma, "So this is special to me." After sharing her story on Facebook, Emma said she received lots of messages of support. "It's really nice to hear that obviously, what I'm feeling, that other people have gone through it, and to know that there are people out there who are planning weddings and not having their mum there," she said. Amanda Weise, who runs the online shop Lace and Love which customises shoes, said it was "lovely" to be able to be involved in the touching gift. "It's probably the most emotional pair of shoes I'm ever going to make," said Ms Weise, from Barrow upon Soar. "Hopefully it will give her a bit of comfort on the day. It will be like walking down the aisle with her mum." She said she was contacted by Emma's mum a few weeks after the initial order was placed. "It was her mum who told me she had cancer and wouldn't be there for Emma's wedding day. She told me on the first message she sent me." "I was aware that she was terminally ill at the time. I think Emma was kind of hoping she would see the wedding. From the message that she wrote, I think she did intend for it to be after she was gone." How do you talk about dying to someone who is dying?